Fonts are undeniably fun--and abundant. Thousands are free for the downloading, and more are available if you're willing to pay. 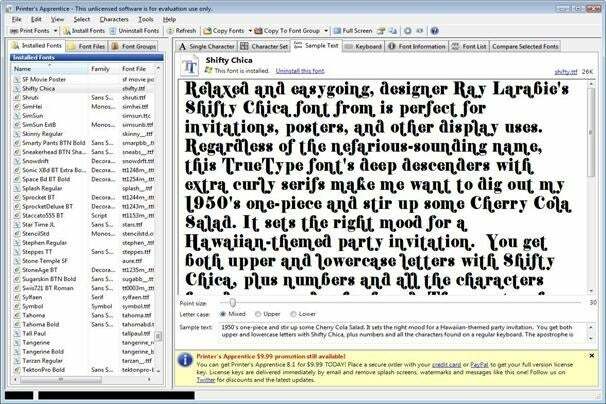 Windows 7 itself installs more than 200 fonts as the default array of choices. But you won't want to mess with the Windows\Fonts folder, since accidentally moving or deleting Windows system fonts can have serious consequences; and storing your fonts in scattered folders can be confusing. If your work requires you to sort and select fonts--whether they're in your Windows\Fonts folder, in other hard-drive locations, or on a CD--you need a program like Printer's Apprentice ($29). Printer's Apprentice provides a list of all the fonts installed in one folder and lets you see sample paragraphs, as well as individual glyphs. Once you've located the folder you want, Printer's Apprentice will list all of the fonts installed there. You can sort the fonts within by style (regular, bold, italic, bold italic), file format (TrueType, OpenType, Type 1), and family (Decorative, Mono-spaced, Sans Serif, Serif, Script, Symbol). You can also use Printer's Apprentice to create groups of fonts in sorted combinations--TrueType script fonts, for example--which Printer's Apprentice can then display together for you to compare. You can view only one folder at a time, however; and unlike FontExplorer X Pro ($79), Printer's Apprentice can't automatically search for and gather all of your fonts into a single folder. Using Printer’s Apprentice, you can preview individual fonts as a single character, character set, sample text, or keyboard layout. Printer's Apprentice allows you to preview entire paragraphs of text on multiple lines, and easily switches from mixed uppercase and lowercase to uppercase or lowercase only; these features are much easier to use in Printer's Apprentice than in the relatively complex FontExplorer X Pro. However, Printer's Apprentice is not great for managing the size of your font folder. When you choose to uninstall a font, the program offers you the options of deleting the file, moving it to a different font folder, or leaving it in the Windows\Fonts location. It's prudent to set up a unique folder and save to it when you use Printer's Apprentice for this task; otherwise, you'll have to remember the name of the font if you ever want to reinstall it: There's no easy way of finding uninstalled fonts using Printer's Apprentice. You can uninstall system fonts, too, though this is generally a very bad idea: Printer's Apprentice will warn you that the operation is not recommended, but it will allow you to proceed. Printer's Apprentice is a useful tool for viewing and comparing your fonts and printing samples, and even for viewing font collections that you may or may not want to install. But even though it does a flawless job of installing and uninstalling your fonts, you need to be pretty organized to avoid getting in a real mess--and once you lose a font, Printer's Apprentice isn't much good at helping you find it. If you need (and can afford) a powerful font management tool, go for the professional-level FontExplorer X Pro, which is harder to learn, but manages your fonts with ease and poise, disabling unwanted fonts rather than uninstalling them. On the other hand, if you're on a tight budget, have too many fonts, and need help organizing them, Printer's Apprentice is great at grouping and comparing fonts, and helping you decide which to keep and which to delete. It certainly works better than trying to delete fonts in Windows\Fonts manually. And if you regularly download font packs or have fonts stored on CDs, Printer's Apprentice is a cheap and easy way to view them and decide which to download...or not. View your fonts, sort them into groups by common characteristics, and delete unwanted sets, with Printer's Apprentice.